Hand painted porcelain jardinière decorated by amateur artist Gertrude M. Anderson Armantrout. She signed and dated each piece, marking this one "August 1915." 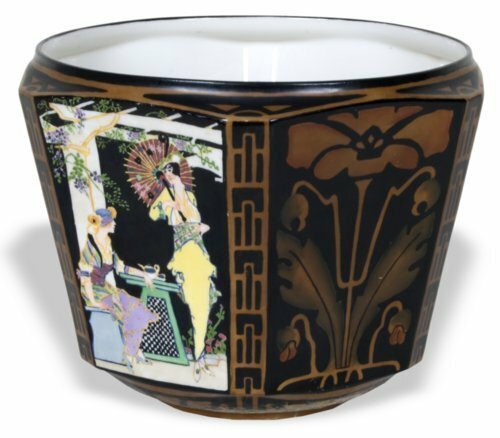 Born in Topeka, Kansas in 1891, Armantrout painted china as a hobby from 1906 to 1936. Some pieces were exhibited at state fairs in Oklahoma and Kansas. Many of her works were featured in newspaper and magazine articles. Armantrout's daughter, Marjorie Davis, inherited the collection in the late 1960s. The Ceramic Art Company produced this jardinière as a blank between 1906 and 1915 in Trenton, New Jersey. The company, now known as Lenox, began in 1889 as a partnership between Walter Scott Lenox and Jonathan Coxon. Functioning more as an art studio than a factory, they employed a small group of artists. In addition to selling decorated pieces, the company also offered undecorated shapes for use by professional and amateur china decorators.